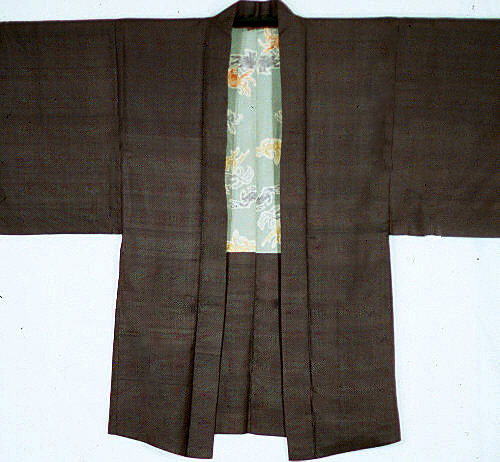 This bold and unusual Informal Haori or topcoat was intended for wear in the home. It has been entirely hand woven, and hand sewn both inside and out and is totally reversible. 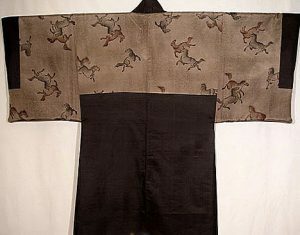 To be able to wear such a sumptuous Oshima Silk informally indicated that this Haori could only have belonged to an individual of substance from the Okinawan chain of islands. 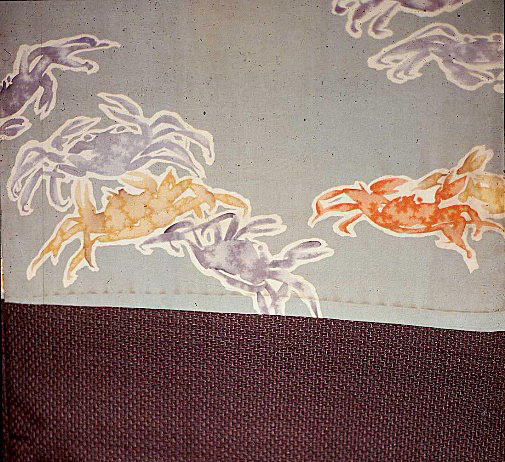 The design of the Crabs, “Kani,” is quite rare, and audacious. 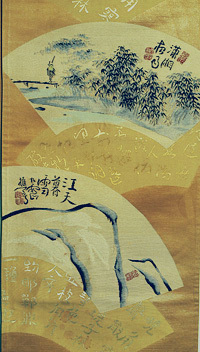 The inner lining panel has been hand stenciled in uncommon pastels in an overall repeat Kani motif. 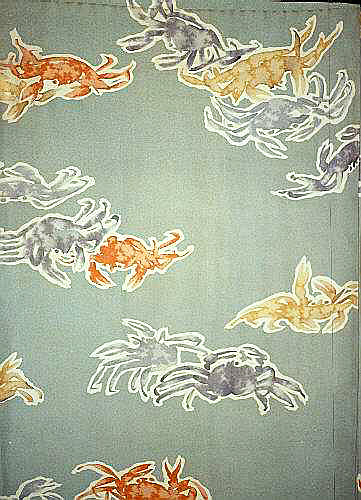 The Crab has been used as a family crest by Samurai families because of the martial significance of the crabs’ armor and alert defensive posture. It is considered a majestic animal and represents the authority of early warriors. The extremely fine threads, beautiful weaving, and imaginative patterns in Okinawan Silk are unrivaled in the exquisite quality of its weaving. 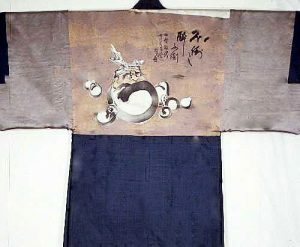 In ancient Okinawa, to envelop your body with a woven cloth represented your desire to embrace and to protect the sacred spirit concealed within the body. 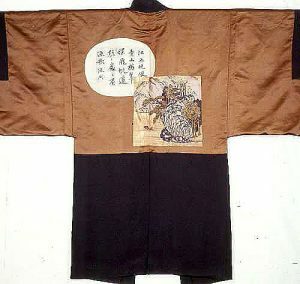 Thus, this Haori was much more than a protective covering, before the development of any aesthetic or social significance; it also expressed a religious belief. The hand-woven Silk was spun from the textured floss that was derived from the leftover silk cocoon. 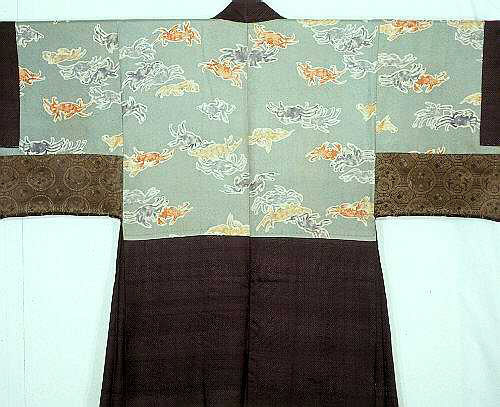 Its matte finish gave it the appearance of shiny cotton, allowing Okinawans who were denied the ability to wear Silk by law, the perfect way to do so. The weave is distinguished by Silk fibers that have been tied with string in predetermined areas dictated by the desired design, then immersed in a natural dye. 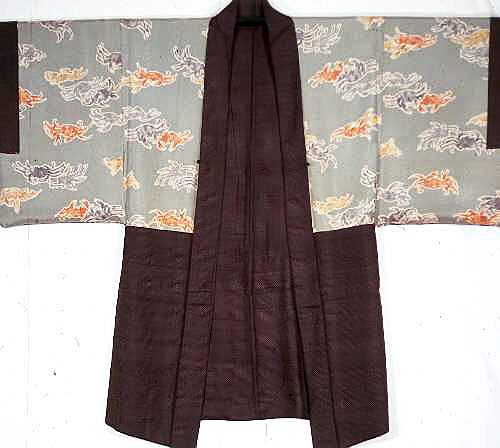 Combining the iron rich soil of Kume Island with the natural colors of Okinawan plants produced the famed deep black brown colors of Oshima; which, alone, created many of the other variations in natural dyes. This fine fabric is greatly prized and extraordinarily expensive today, as it required a year’s work for the weaving of one garment. Oshima Island lies in Kagoshima Prefecture in the Okinawan chain of islands. Hand woven Oshima Silk tweed with an inner Silk lining panel in excellent condition.